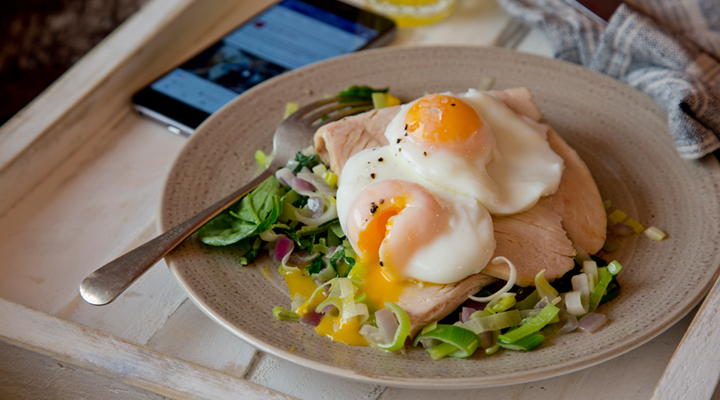 If you’ve got some leftover turkey, why not use it to power up your breakfast? 1. Melt the butter in a large frying pan set over a medium heat. Add the onion and leek and sauté for about 8 minutes, until they are soft and tender. Add the spinach and allow it to wilt. Add the slices of turkey breast, placing them flat on the pan just to heat them through. Season with salt and pepper. 2. Meanwhile, bring a saucepan of water to the boil, then reduce to a gentle simmer. Crack each egg into a separate cup or ramekin. Use a spoon to create a gentle whirlpool in the water to help the egg white wrap around the yolk. Slowly tip the egg into the water. Leave to cook for 3 minutes. Remove with a slotted spoon and place on a plate lined with kitchen paper to soak up the excess water. Repeat for the remaining eggs. 3. To serve, place two slices of turkey breast on each plate. Top with the sautéed onion, leek and spinach and finish with two poached eggs. Season with a pinch of salt and pepper and serve straight away.